Rožmberk castle is located about 20 km to the south of Český Krumlov on a long headland above the Vltava river. The castle was named after the five petal rose that its founder Vok z Prčice had in his coat-of-arms. The German name Rosenberg (Rose castle) was Czechicized on the name Rožmberk. The Rožmberk castle is composed of the remains of the Upper castle founded in the 13th century of which the Gothic tower called Jakobínka remains and of the Lower castle that was built in the 14th century and later in the 16th, 17th and 19th centuries it was rebuilt. During the 19th century the new residential and farm houses were built that were situated approximately on the place of the original Upper castle. The Lower castle is open to the public and it is composed of the two-floor building of irregular character with a closed oblong shaped courtyard. The original palace is situated on the south side, the north side is composed of a long Crusaders\' gallery, on the eastern entrance side there is the transversal wing with the needle-like tower ending with the Neo-Gothic crenellation. This tower dominates the whole castle. The inner and outside facades are not articulated and they are covered with graffito decorations. It is possible to enter the castle from the east side over a bridge with a deep moat. The construction of the Upper castle began before the first half of the 13th century. That castle was composed of the tower situated on the highest point of the headland, and the palace that was surrounded with a wall and moat. Only the tower called Jakobínka is preserved until today. This tower has circular design and it ends with corbels that originally supported the wainscoted ceiling. The roof was replaced by a walled cover. 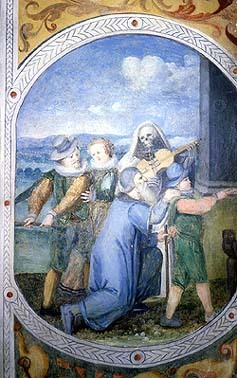 In the thirties of the 14th century, at the time of Henrich III. von Rosenberg, the Lower castle was constructed and its main features remained until the present times. In 1522 the Upper castle burnt down and it was never again been reconstructed. In 1556 the Lower castle was reconstructed in the Renaissance style. Its facades were decorated with graffiti and also the inner character of the castle was changed. At that time there was also a Renaissance building founded by the wall. At the end of this building a gate leading to the town was built. 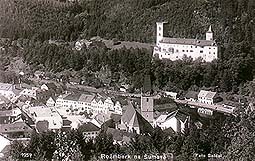 In 1600 Jan Zrinský of Seryn who was the nephew of Peter Wok von Rosenberg received the Rožmberk castle. The new owner ordered great changes of the interiors in the Manneristic style. 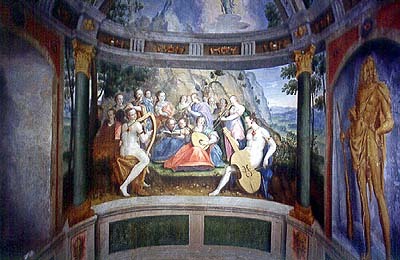 Painted decorations in the Knight\'s hall and the contiguous Music niche are especially famous (History of Painting in the Český Krumlov Region). The Gothic castle was changed into a presentable residence in the Renaissance style. 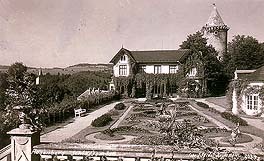 Other significant changes were made between 1840 - 1857 at the time of Jan Jiří Buquoy, who was influenced by Romanticism and who rebuilt the Rožmberk castle in the Neo-Gothic style as a family museum of the Buquoys. At that time the Crusaders\' gallery was founded and the new entrance stairs and interiors were furnished with historic furniture. Since then the Lower castle was used only for representative purposes and the newly built residence with out-buildings and an English park, which was situated approximately on the place of the original Upper castle, was used to live in. 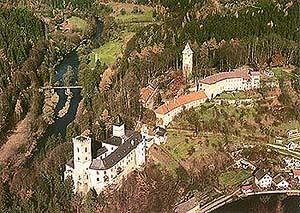 The Rožmberk castle was founded in the first half of the 13th century by a member of the powerful family of the Witigonen, Vok z Prčice who later called himself after this castle Wok von Rosenberg. Very soon in the barbican a tributary town grew. 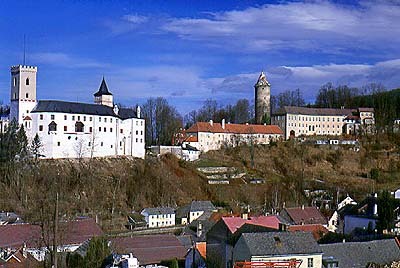 The castle became the administrative and economic centre of the estates, a part of which Wok von Rosenberg gave to the newly established Cistercian monastery in Vyšší Brod. In 1302 when the second branch of the Witigonen, Lords of Krumlov, died out, Wok´s offspring inherited Český Krumlov and they settled there permanently. In 1420 Ulrich II. von Rosenberg (1403 - 1462) was forced to pawn the castle to the Lords of Walsee from Austria to get money to finance the army against the Hussites. The Rožmberk castle was later paid off but in 1465 it was pawned again to the Lobkovic family. The castle was also in this case paid off. In 1600 Peter Wok von Rosenberg passed the castle with estates over to his nephew Jan Zrinský ze Serynu (1565 - 1612) who owned it until his untimely death in 1612. The estates were inherited by the Švamberks, relatives of the Rosenbergs. But they lost the castle very soon because all their estates were confiscated after the battle of Bílá Hora and were given to the commander of the imperial army Karel Bonaventura Buquoy. The family whose the main residence was in Nové Hrady, kept the castle until 1945, when it was during the post-war confiscation taken and nationalised. The castle was opened to the public in the middle of the 19th century as one of the first museums in Bohemia. Two traditions are meeting in this museum. 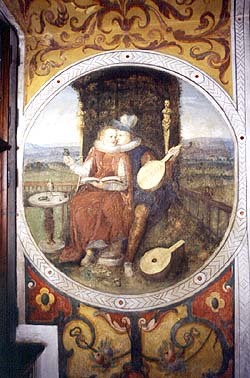 The tradition of the Rosenbergs, reminding the founder of the castle, is represented by the Renaissance graffito decoration of the outside facades with beautiful painted decorations of the interiors (especially the famous Music niche in the so-called Knight\'s hall). The tradition of the counts of Buquoy celebrates history and deserts of this family who owned the castle until 1945. Neither the style nor the furniture of the castle have been changed since the reconstruction in the Romantic style was made. The interiors mostly renovated in the Neo-Gothic style, are furnished with valuable pieces of furniture, some of which are made especially with special wood carving for the use of the museum. The castle picture gallery contents a few valuable Czech and European pictures of the Late Renaissance and Baroque. 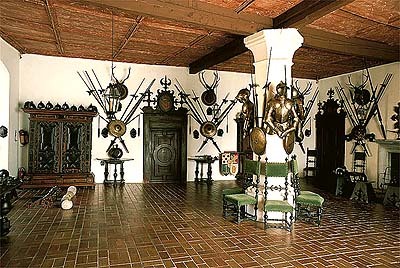 The armoury has a unique collection of stabbing and cutting weapons, arms and relics of war. The heritage of the Rosenbergs is still watched by the mysterious Perchta von Rosenberg called the White Lady whose picture is hung in one of the rooms. Rožmberk nad Vltavou castle that is in the administration of Heritage Authority of České Budějovice is open to the public who can see here the historic interiors, the Knight\'s hall in the Renaissance style and the valuable collections of pictures and applied art. 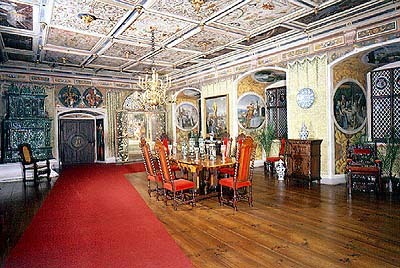 Apart from the sightseeing tour, visitors can also visit exhibitions arranged in the castle\'s rooms.